Aucklanders are advised to be aware when the region’s twice-yearly tsunami siren test sounds at noon on Sunday 7 April in the Rodney and Waitakere ward areas. The test sequence will be three sets of tones, each signalling a specific action people are advised to take in a real emergency. The test coincides with the end of daylight saving. The tests will sound for two minutes each with one minute between each set. In an emergency, tones will last for longer. “It’s important to test the sirens to make sure they’re working, and that Aucklander’s know what they sound like,” says Sarah Sinclair, Auckland Emergency Management acting director. There are several public warning systems that Auckland Emergency Management has in place for the Auckland region. “People can also subscribe to SMS text messaging or email alerts, the Red Cross Hazard smartphone app or engage with us via Twitter and Facebook,” she adds. In addition to the tsunami sirens, Auckland Emergency Management will also be testing the Red Cross app as well as sending messages to those signed up to emergency alerts. Follow Auckland Emergency Management on Twitter and Facebook. “It’s a good time for families and friends to have conversations about planning for emergencies, especially preparing getaway kits or agreeing on meeting places if you are not together,” says Sarah. The tsunami sirens are in Rodney at Point Wells, Whangateau, Omaha and Waiwera. 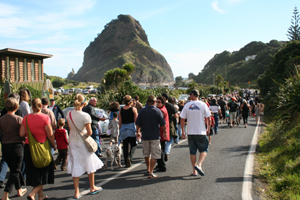 In Waitākere sirens are located at Bethells Beach Te Henga, Piha North, Piha South, Karekare, Whatipu, Little Huia, Huia, Te Atatu South, Harbour View Road, Te Atatu Peninsula North, Westpark Marina and Herald Island. For everything you need to know to get ready for an emergency, visit the Auckland Emergency Management website. Alert (dash – dash – dot – dot) sounds for 15 minutes and indicates the threat of a tsunami. Evacuate beaches, prepare for full evacuation and monitor the radio or television for more information. Evacuate (dot – dot – dot) continuous bursts for 15 minutes indicates immediate evacuation to the nearest safe high ground. Please avoid using personal transport unless essential. All clear (continuous tone) sounds for 5 minutes indicate threat has passed. Return to premises if they have not been affected and follow directions of the emergency services if your area has been affected.